Enjoy video chat with the Vision camera or a Kinect sensor and an Xbox Live membership. To set up the Vision camera, connect it to the Xbox console and specify your Online Safety and Privacy settings. Plug the Xbox Live Vision camera into a USB port on the front of your console. The light on the camera will blink to indicate that the camera is connected. Position the camera on a stable base, pointed toward you. For audio, connect an Xbox 360 Headset. On your console, go to Settings, select System, and then select Xbox Live Vision. Your TV or monitor displays what the camera sees. Focus the camera. Turn the lens to the right to move the focus out, and turn it to the left to move the focus in. Online safety and privacy settings help you control access to video communication. For example, you can block video communication for child accounts and limit video chat to just friends. Use your Vision camera with Video Kinect to have live video conversations with your Xbox Live friends. Make sure you set up Video Kinect before you use it with your Vision camera. Go to My Friends, select the friend that you want to video chat to and then select Video Kinect. Go to Apps and select My Apps. Select Video Kinect, select More Friends and then select a friend. 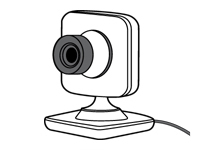 The Video Kinect session starts when your friend accepts the video chat invitation. 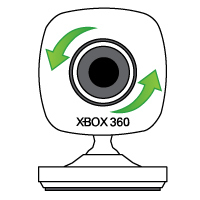 Note When an Xbox Live Vision camera and a Kinect sensor are both connected to an Xbox 360 console, only one can be active at a time. See Using an Xbox Live Vision camera and a Kinect sensor for more information. You can use the Vision camera to take a gamer picture. People in your friends list see your gamer picture. On your console, go to Settings and select Profile. Select the camera button to take a picture. Select Change Personal Picture if you want to use the new image. Clean only with a dry or slightly damp cloth. Using cleaning solutions or trying to clean connectors might damage your camera. For the lens, use only soft, dry, lint-free cloth or lens paper. Would you like to contact Support regarding the "Set up and use the Xbox Live Vision camera on Xbox 360" issue you were reading about or a different issue?